The kilo class submarine, which was retrofitted in the Zvyozdochka shipyard, in Severodvinsk arrived in the Mumbai port on Monday. The INS Sindhurakshak, a diesel-electric submarine of the Indian Navy that underwent interim overhaul and modernisation at the Russian Severodvinsk-based Zvezdochka shipyard, arrived at the Mumbai port today, a senior Russian naval official said. “The submarine reached Mumbai this morning,” Rear Admiral Aleksandr Litenkov told RIR. Alongside Indian officials, the crew was greeted by staff of the Consulate General of Russia in Mumbai and the Russian Embassy in India. The general director of Zvezdochka, Vladimir Nikitin, was already there a few days before the submarine’s arrival. INS Sindurakshak departed from the White Sea to its home shores on January 29. The situation was complicated by the fact that for the first time the passage began in icy conditions. On its journey south, the submarine was accompanied by the Dixon icebreaker and the Vityaz tugboat. Prior to that, the vessel successfully underwent a series of tests in the White Sea, including missile and torpedo launches. According to Rossiyskaya Gazeta, both targets — one at sea, the other on land — were hit in the first attempt. The handover ceremony took place on January 26 — India’s Republic Day. The commander of INS Sindurakshak, Rajesh Rajkumar, who signed the official act of transfer of the submarine, thanked the Russian shipbuilders and suppliers for their coordinated work. Furthermore, as a sign of special favour, the governor of the Arkhangelsk region, Igor Orlov, placed an icon of the Archangel Michael on board the submarine as a blessing to the sailors’ long and prosperous service. The kilo class submarine was retrofitted in the Zvyozdochka shipyard in Severodvinsk, north-west Russia. The Indian Navy's fifth submarine, INS Sindurakshak was given a new lease of life at the shipyard. Since 1997, it has modernized the Sinduvir, Sindhuratna, Sindugosh, and Sinduvijay submarines. The fifth (and counting) is armed with the latest Club-S missile complex and more than a dozen new systems of Indian and foreign manufacture, including the Ushus hydroacoustic (sonar) system and Porpes radar station. “It was a very wise decision on the part of the Indian Navy to completely modernise and retrofit the submarine in the Zvyozdochka shipyard,” Rear Admiral Litenkov told RIR, adding that the shipyard would be ready to assist India in modernising its naval fleet. Submarines of this class (all built in Russia as part of Project 887EKM Kilo) are designed for anti-submarine warfare and for combating enemy vessels, as well as protecting naval bases, coastal and maritime communications, and reconnaissance and patrol units. The contract for intermediate overhaul and modernisation of the Sindhurakshak was signed between the Zvyozdochka ship repair centre and the Indian Ministry of Defence in June 2010. 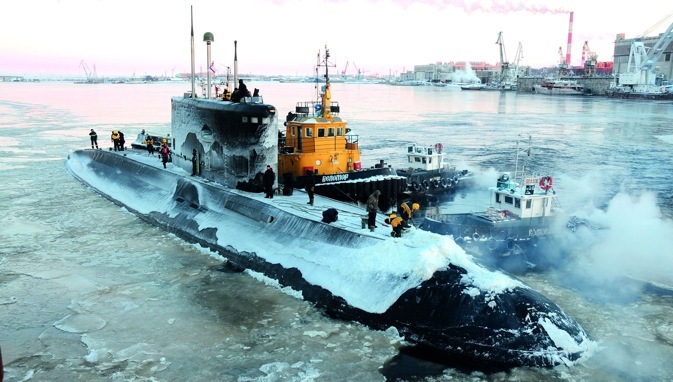 The submarine arrived in Severodvinsk and was accepted for repairs in August of that year. The vessel's route to its native shores traversed six seas and two oceans — the Atlantic and the Indian. In three months, INS Sindurakshak covered around 10,000 nautical miles. As per established procedure, a group of experienced professionals was engaged for the voyage to India, headed by Zvezdochka's senior constructor Leonid Bibik, who was charged with delivering the vessel. According to his report to United Shipbuilding Corporation, the passage was made on schedule and via the approved route, with technical stopovers at ports in Spain and Egypt. The material part of the ship is in good repair, the observations made during the passage have been addressed, and the submarine is ready to enter service. A typical kilo-class submarine has a displacement of 2,300 tonnes, length of 72.6 metres, a submerged speed of 19 knots (about 35 kilometres an hour), a test depth of 300 metres, a crew of 52 and endurance of 45 days. These submarines are armed with six 533 mm torpedo tubes. The modernisation arms the submarines with additional state-of-the-art Russian Club S anti-ship missiles (designed by the Novator bureau) with a range of about 200 kilometres. Supplementary Indian-made equipment includes a USHUS hydro-acoustic unit and CCS-MK communications system. INS Sindhurakshak was built in 1997 by the Admiralteiskie verfi shipyard in St Petersburg for the Indian Navy. Zvyozdochka has become a leading partner of the Indian Navy in maintaining the combat readiness of the kilo class submarines, experts in Moscow and Delhi say. Zvyozdochka provides its services not only at its Severodvinsk shipyard, but also at the home station of the Indian submarines. The shipyard has two covered ship-houses with seven building berths designed for repairing and building vessels weighing up to 18,000 tonnes. United Shipbuilding Corporation controls 100 percent minus one share in the shipyard through its subsidiary OAO Northern Centre for Shipbuilding and Ship Repair. Severodvinsk expects to receive its next order from India in 2014 or 2015. In the meantime, it will repair and upgrade INS Sindukirti at its base in Visakhapatnam in the Indian state of Andhra Pradesh, and provide after-sales support for ships previously modernised by Zvyozdochka. “Our first foreign ship was the Sinduvir diesel-engine submarine, which we repaired and delivered to India in 1999. Three years later, Zvezdochka returned the Sindhuratna diesel-electric submarine to combat service —we carried out pilot operations to equip it with the Club-S missile system. Three years later, INS Sindughosh set sail from Severodvinsk to its native shores. In addition to the Club-S complex, we installed Indian-made systems, namely the Ushus sonar system and CCS communications system. INS Sinduvijay, which was transferred to the customer in 2008, was also equipped with a few more of the latest systems, including ones of Indian manufacture.